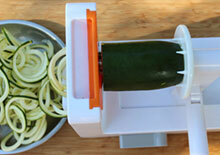 Our Top Favorite Plus Other Best-Selling Models What is a vegetable spiralizer? Most health-conscious chefs today have heard of these very handy and inexpensive specialized slicers that, with some hand cranking involved, can basically create gluten-free, vegan, low-carb pasta-like noodles. Whether you're looking for creative, colorful and/or nutritious ways to add more vegetables into your diet or trying to eliminate refined grains, a vegetable spiralizer can be a simple way to add flair and texture to your meals. Learn about some of the top-rated brands as well as our own personal favorite vegetable spiralizer model.